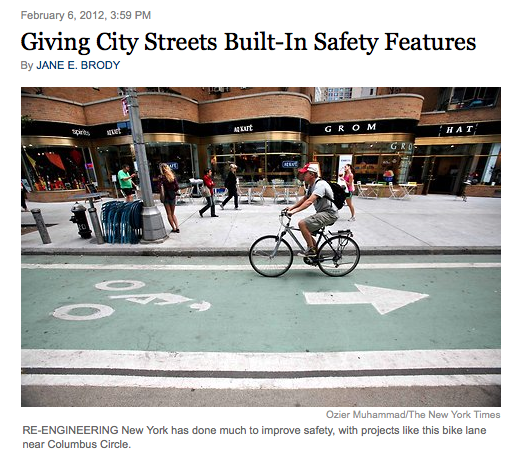 The commenters below Jane Brody’s otherwise excellent story about the “built-in safety features” of New York City’s new street designs are having a field day with the photo that accompanies the piece. Can you blame them? The arrow is what’s wrong with the picture. Honestly, much of the danger from riding the “wrong way” in a lane is because there are vehicles coming the other way that can kill you, and that are going fast enough they can’t reasonably avoid hitting you. It’s a law for a reason, but it specifically relates to automobiles. The same danger isn’t there on a separated bike path. Figures that people would focus more on the photo than the piece it accompanied. Some people get so distracted by brightly colored pictures, they don’t see what’s important. I agree that the bike lane is so wide that is could work fine as a two-way lane. The conflicts between cyclists going in opposite directions should be minimal. That said, there is another, more important reason why it is dangerous to ride the wrong way. Drivers and pedestrians don’t (or should’t have to) expect you to ride the wrong way, so they are less likely to look in your direction when crossing the bike lane. As far as pedestrians are concerned, this can cause conflicts anywhere, because pedestrians tend to cross wherever they want. As far as drivers are concerned, this is a very real risk at intersections. Drivers that are making turns, for instance, will only be looking for cyclists going the right way (OK, assuming they look for cyclists at all!) If I remember correctly, most fatal crashes between motorists and cyclists, in cities at least, involve drivers turning into a cyclist that they didn’t see. And riding the wrong way is one great way of increasing the likelihood of that happening. That’s what’s wrong with the picture.